MTL Instruments' F300 Series of Megablock wiring hubs for fieldbus applications is designed for general purpose, Zone 2 and Division 2 hazardous area applications where the high energy trunk can be powered by a wide range of fieldbus power supplies and the ability to conduct live maintenance - such as replacement of field devices in hazardous areas is desirable. Live connection and disconnection of fieldbus spurs without a gas clearance certificate is allowed with Ex ic and non-incendive field devices but where live-working of the spurs is not required, Ex d (flameproof) or Ex nA (normally non-sparking) field devices may be selected. The new F300 Series features a pluggable Trunk In/Out connector allowing replacement of a Megablock without breaking the trunk connection to other devices on the fieldbus segment. The compact F97 terminator may be mounted in the Trunk out connection to provide termination when the Megablock is located at the end of the fieldbus segment. It can be removed when the segment is extended, thus ensuring correct termination. Megablocks minimize hand wiring and allow individual devices to be added to and removed from the segment without disrupting network communication. The pluggable connectors are screw secured ensuring reliable connections even in high vibration environments. Attention to detail includes the +/S/- fieldbus connections to prevent intermittent connection to an adjacent terminal causing fieldbus failure. A green power LED on each unit indicates whether at least 10V of DC power is present and pluggable surge protection components for the fieldbus trunk and individual spurs are available as an option, reducing the installed cost of providing surge protection on fieldbus networks. 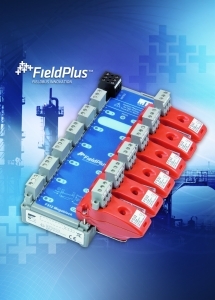 The F300 Series Megablocks are part of the recently created FieldPlus brand initiative from MTL that is designed to make fieldbus component selection as easy as possible based on the network architecture being employed. By visiting www.fieldplus.info, system integrators, specifiers and engineers alike can benefit from MTL’s range of differentiated fieldbus solutions, providing assistance in selecting the optimum architecture to deliver customer value.